Umbria is not a place I had ever thought of going. Tuscany, of course; Umbria, why? But then again, why not? Having no real expectations when we began planning this trip, we became more and more excited about what we would find. Now that we have visited, I can definitely say that it was worth the trip. We were in Umbria at what must be one of the most beautiful times of year. The landscape is often routine but coupled with hill towns that are anything but. We visited too many towns to describe them all, but our overall experience is enough to recommend to anyone that they include it on their travel list. We began our first full day in Todi. Like Monticello where we stayed, Todi rises out of the ground with breathtaking beauty. While accessible by car, it is easier to park at the bottom of the hill and take the “funicular” to the top of the hill, ie. the edge of Todi. A funicular is most effectively described as an outdoor escalator. Two churches were visible at the peak of the hill. There were so many churches in the small towns and cities we visited that I finally decided that building a small church was the best way for a family of affluence to be confident they could be buried in a prestigious building. Throughout the town, stone buildings clung to the hill as though they could literally slide down to the valley below. The residents seemed to be perpetually walking up and down–but never on flat ground. While open to traffic, the stone and brick streets are most used by walkers and a few motor scooters. Tourists were present but did not dominate the town. The walls of Todi seem to have been built and rebuilt through the centuries as evidenced by the patchwork of brick and stone in the walls. Maybe the walls have, in fact, slid down to the valley as they have weakened. I don’t know. We ate lunch at the Umbria Restaurant, where the view was wonderful and the food quite good. We finished eating at 2:30, at which time the shops, churches and museums closed, not to reopen until 3:30. We immediately realized we would have to alter our travel schedules to adjust to the Italians. They certainly would have no reason to adjust to ours! Every day seemed to be the best day of our trip. 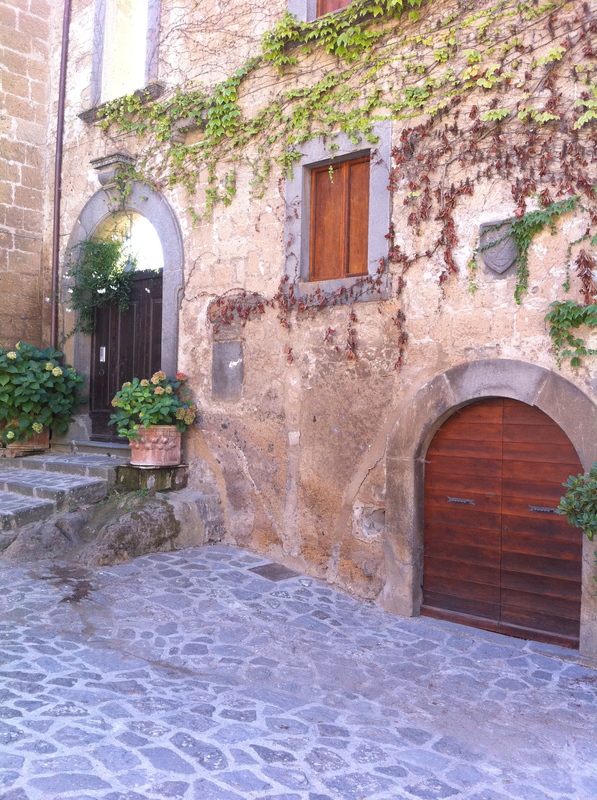 We visited Orvietto and Civita Di Bagnoriego our second day. Two hours in Orvietto was barely enough time to scratch the surface. Again we arrived by funicular. It is a quick way up these steep hills. It was lovely and seemed to be a place where people lived, rather than toured. 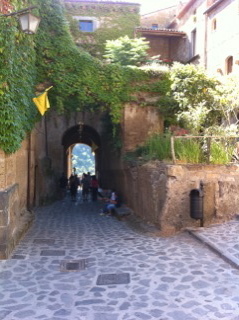 There was no funicular at Civita di Bagnoregio. This ancient city is separated from the land around it by a deep valley. It is accessible only by a long walking bridge. The route began with a hike from the car park followed by a steep and extended trek down the hill via a stone stairway, followed by an extended walk to the bridge. The bridge itself begins with a gentle slope before rising more steeply up to the wall of the city. We were told only nine people live here full-time. One of the residents said that their property had been in the family for hundreds of years. There are more restaurants than residents. I never quite figured that out! The food was quite simple but tasty. It was cooked in hot earthen ovens with hot coals continuously placed behind the cooking area. The simplicity of the food did not minimize the obvious challenge required to provide food and cold drinks to those physically fit enough to desire them. The simple church was lovingly tended. Instead of a center rug, decorative cut flowers had been painstaking spread in a pattern over the center aisle. The lives of the inhabitants were also simple. Some living quarters were behind gates and appeared to be carved out of the stone from the hill itself, with only iron fences between the residents and the steep slopes. Not a place for the frail or fearful. Certainly not ADA compliant! Monday was devoted to St. Francis. I’m not Catholic, but he is my favorite Saint. The Basilica Santa Maria degli Angeli is at the foot of Assisi. It is there that St. Francis is said to have discovered his vocation and where he founded his first small church. 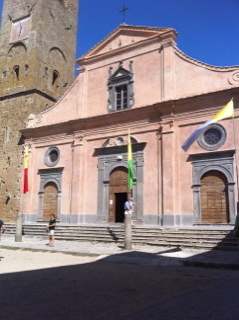 This original church sits within the Basilica. During our visit, religious services were actually being conducted in the tiny interior church. St. Claire is buried in the Basilica. After touring the Basilica we drove the few miles to Assisi. It is more beautiful than I had anticipated, although the tourism seemed incompatible with St. Francis’ humble message. I wondered how he would feel about it all. More important, as things progressed, I wondered how he would feel about Assisi’s neighbor, Narni. Narni is another walled town on a hill. A lovely little town, it is famous, if at all, as the location of an inquisition court where trials were held from about 1600 to 1880 A.D. Only fairly recently have the court and the adjacent cell been discovered. It sits immediately below a small church were, presumably the messages of Christ were preached from the pulpit. Below, the court and adjacent cell, where prisoners were held, are small, dark and completely under ground. They appear to have been intentionally hidden. Our guidebook advised us that records concerning this court were found in the Vatican archives sometime after 1970. The instruments of torture depicted in drawings at the site were cruel and barbaric, capable of inflicting horrible pain and humiliation on alleged heretics within a few feet of where others worshipped a loving God. What would St. Francis say? On Wednesday we traveled to Montefalco, with architecture reminiscent of Latin America, and then to Bevsagna. Interesting towns, the first devoted to wines and linens. Lovely but we declined to buy. There must be dozens of similar walled cities in Umbria, I have mentioned only a few. While it was a wonderful adventure, we were ready to return to K.C. Of course, we both knew that we will become restless to visit more beautiful and amazing places. But without question if someone asks about my favorite vacations, I will tell them about Umbria. This entry was posted in Travel & Adventure and tagged inquisition, Italian Hilltowns, Umbria. Bookmark the permalink.